Chairman of ESL Investments hammered by sluggish investments; has seen net worth fall $1.5 billion in past 12 months. Much of portfolio in Sears Holding. Shares down 35% since last September; margins falling amid retail industry woes. Another dud: AutoNation. Also owns stake in AutoZone. Lawyer's son spent spare time in high school reading corporate reports and financial textbooks. Studied at Yale. Took job at Goldman Sachs, mentored by Robert Rubin. Snagged early investment from Richard Rainwater. Founded his own investment shop in 1988. 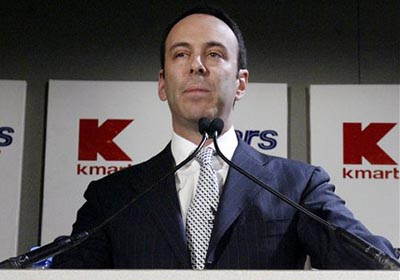 Nabbed Kmart in bankruptcy buying up its bonds on the cheap. Merged with Sears, Roebuck; became chairman of combined company 2005. Clients include Michael Dell, David Geffen, Tisch family's Loews Corp.
Skull & Bones A secret society associated with Yale University.